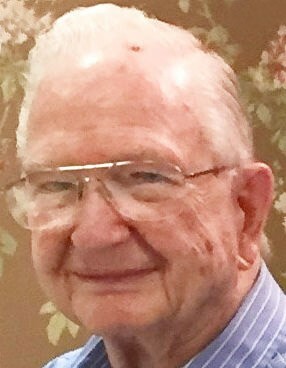 Glen Casteel, Jr., 93, of Landmark Commons in Waterloo, IA, died on Friday, August 10, 2018. He was born on October 23, 1924 in Herculaneum, MO to Nora E. and Glen E. Casteel, Sr. and spent his early life farming. He served in the Navy during WWII as a Pharmacist Mate. Glen married Violet Delores Grittmann on February 11, 1945 in St. Louis, MO and they were married for 71 years. The couple moved to Waterloo in 1947. Glen enjoyed activities with his family, which included camping trips with his children, a trip to Europe, hiking the Grand Canyon, fishing with his grandsons, and wintering in Arizona with church friends. Glen also enjoyed gardening and was famous for his large crops of raspberries and his raspberry wine. Glen was a member of Central Christian Church for over 60 years. He was a deacon of the church and he and Violet delivered Meals on Wheels for many years. They both worked in the church’s food booth at the National Dairy Cattle Congress, served up many monthly chicken dinners and attended the same Sunday School Class for over 50 years. He worked as a machinist at John Deere for 35 years prior to his retirement. He was a loyal member of UAW Local 838. Survived by: his two daughters, Dr. Nancy Casteel of Chicago, IL and Kathleen (Richard) Boudreau of Lake Tahoe, NV; daughter-in-law, Virginia (Ginni) Casteel of Waterloo; four grandchildren, Navy Lt. Bradley (Jodi) Casteel, of Virginia Beach, VA, Brandon (Regan) Casteel of Waterloo, Cassandra Edwards of Citrus Heights, CA, and Christopher (Aubrey) Boudreau of Carson City, NV; five great-grandchildren, Zailey and Zoie Casteel, Brady and Beckett Edwards and Callen Boudreau; and one brother, Charles (Sandy) Casteel of Monroe, LA. Preceded in death by: his parents; wife; son, Douglas Casteel; two sisters, Joyce Dudley and Patricia Casteel; and a brother, Donald Casteel. Loved ones remember him as a good friend and neighbor, a good Christian and a devoted family man. He will be remembered also for his wonderful engaging smile. Services: 10:30 AM Saturday, August 18, 2018 at Central Christian Church, 3475 Kimball Ave. Waterloo, IA. Visitation: 4-7 pm Friday, August 17 at Locke Funeral Home, 1519 West Fourth Street Waterloo, IA.